Mayfly spinners. Every fly fisher knows about them. Most everyone has seen them. But not every fly fisher recognizes when fish are taking them or when they should be imitating them. That’s a big mistake. 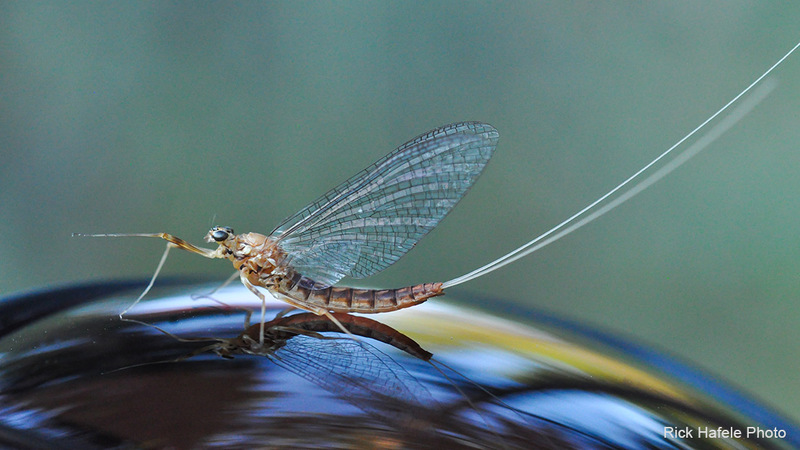 Just in case you are a little cloudy about mayfly spinners, the term “spinner” is the common name for the fourth and final stage in the mayfly life cycle: egg, nymph, dun and spinner. They’re important because they frequently land on the water in great numbers, and trout can’t resist them when they do. More technically, entomologists refer to spinners as imagoes, which is just a fancy way of saying they are reproductive adults. 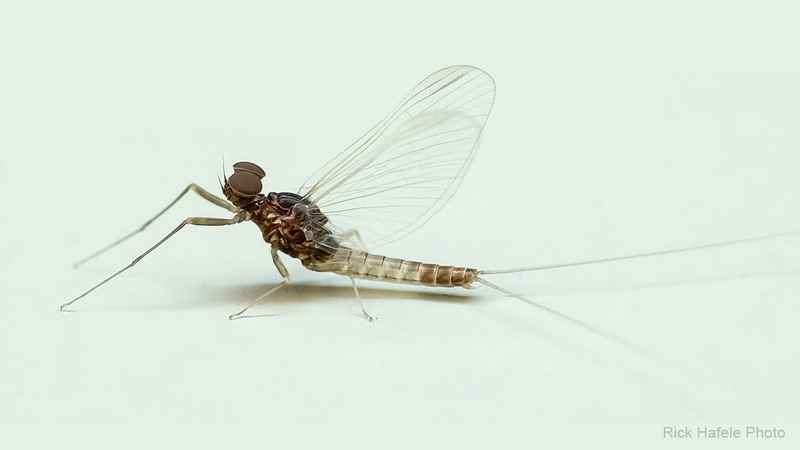 This is significant if you are a mayfly because the preceding winged stage - the dun – look very much like spinners, but are not yet able to mate and lay eggs. Entomologists call duns, sub-imagoes, which literally means the sub or pre-adult stage. 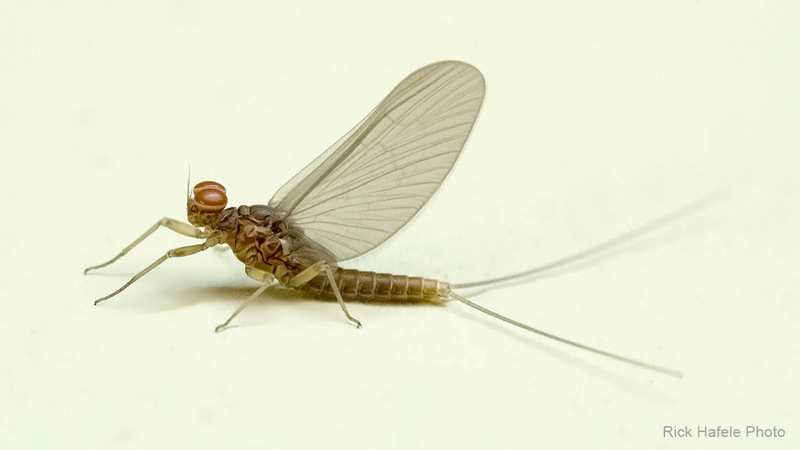 Thus mayflies have two distinct winged stages – the dun and the spinner. One can easily see the dun stage as they emerge on the water’s surface during a mayfly hatch. Those duns not eaten as they drift on the surface waiting for their wings to stiffen, fly off the water and land on nearby vegetation. There they sit quietly until they molt, or shed their exoskeleton, one last time to become spinners. The length of time before the dun molts into a spinner varies from a few minutes to a few days depending on the species. Twelve to 24 hours is typical for many species. The spinner stage lives a similar length of time. Thus, the dun and spinner stages combined may be as brief as an hour or two and no longer than four or five days. In a nutshell, the spinner’s sole purpose is to mate and lay eggs, and they don’t have any time to waste. And mate they do, sometimes in rather dramatic fashion. Typical mating behavior begins when male spinners form large swarms. 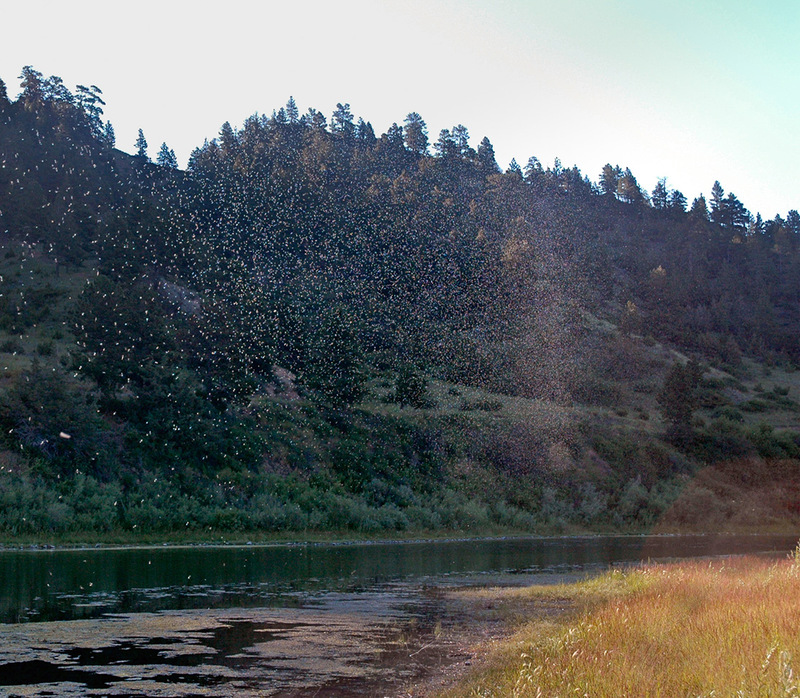 The swarms usually develop over water anywhere from a few feet to over 100 feet high. In some cases, the swarms occur over land hundreds of meters from any nearby water. Males within the swarm fly with an erratic up and down dance-like motion. 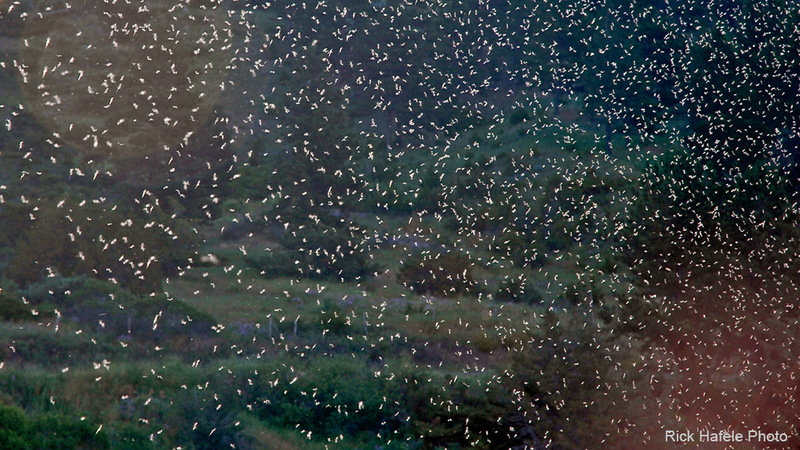 At times the whole swarm of thousands of mayflies seems to rise and fall with a rhythmic pulse. Females fly into the swarm, where males rush to be the first to grab a female in flight to mate. Copulation only takes a few seconds, after which females begin laying eggs one of three ways. Most species glide down to the water’s surface one to several times, and release a cluster of eggs each time the tip of their abdomen hits the surface. Some other species release their eggs in flight above the water. A few species crawl underwater – generally down the side of submerged rocks – and deposit their eggs directly on the bottom. Each female spinner lays somewhere between 500 and 5,000 eggs depending on the species. 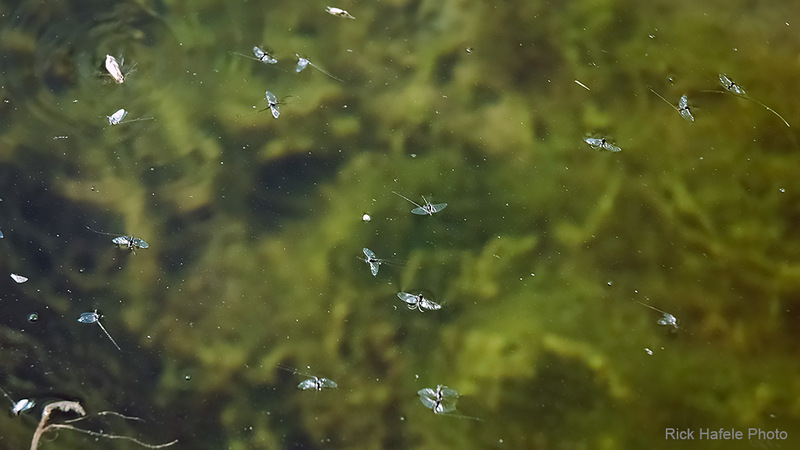 When all their eggs have been released, the females die spent on the water, with their wings stretched out flat, creating what anglers call a “spinner fall.” It’s critical that you learn to recognize duns from spinners, and how to tell when spinner falls are occurring. For some species, duns and spinners look very similar, while in others, they are quite distinct. In all species the key difference is in the wings. The wings of duns are semi-transparent with a smoky brown, gray, or yellow tinge to them. The wings of spinners are completely transparent and clear, except for the dark colored veins running through them. The wings of some species have dark colored spots in both the duns and spinners. Don’t let these spots confuse you. The rest of the wing will show the characteristic smoky color in the dun and be clear in the spinner. The body colors of spinners also tend to be brighter than the dull colored duns. Finally, male spinners have very large eyes for spotting females that fly into the swarm, and noticeably longer front legs than the middle or hind legs. These long front legs help hold the female during copulation. While sometimes it can be tricky to tell a spinner from a dun, when seen side by side there’s little doubt which is which. Spinner falls occur at various times of the day depending on the weather and species. In general during cold weather – fall, winter, and spring – spinner falls occur in the late afternoon. During warm weather spinner falls occur at dusk or early to mid morning. One way to judge if a spinner fall is likely to occur is by the size of the surface hatch of duns. Anglers are well attuned to spotting duns popping up on the water’s surface. When a couple days of good dun hatches have occurred, you should be on the lookout for a heavy spinner fall later in the day or in the morning. One excellent clue is seeing swallows feeding heavily above the water. This certainly means some type of insect is swarming. Look carefully for the up and down dancing flight of the male spinners. A small pair of binoculars aimed at the swallows will quickly tell you if it’s mayflies, midges, or some other insect the swallows are feasting on, and what the trout will be feasting on next. Binoculars can also help you see exactly what trout are taking off the surface. When the swarm of spinners is so thick it looks like fog over the water, you know you are in for some serious spinner fishing. Confusion often begins once the spinners have laid their eggs and lie spent on the water. That’s because spinners, lying dead on the surface with their wings out flat, are virtually impossible to see, especially in the fading light of sunset (use those binoculars). Further, because spinners are dead, fish feed on them with leisurely, very subtle, almost invisible, rises. Therefore, what the angler sees is a few small rises that look like dinky little fish, and no insects flying off the water to indicate a hatch worth fishing. What the angler doesn’t see is the large size of the fish below those dinky little rises, or the spinners floating flush in the surface film. So just when things get interesting, many anglers think it is all over for the day and head home. Remember, spinners in the air will mean spinners on the water, even if you can’t see them. So, if you see spinner swarms, pay very close attention to the water for softly rising fish, and look for dead spinners caught in small pockets of dead water behind near-shore rocks or debris. If you find some, definitely pick them up so you can get a fix on their size and color and select an appropriate pattern. Excellent spinner fishing doesn’t always result in excellent fish catching. I have found that trout feeding on spinners can be some of the pickiest and most difficult trout I’ve ever fished for. Part of the reason is that since the spinners are dead they make no movement on the water other than what the current imparts on them. Therefore, un-natural drag on your fly, of even the smallest amount, will tip off trout that something isn’t right. The other problem is that trout can take up feeding lanes in quiet water where the current funnels spinners down to them. The smooth surface makes it easy for fish to spot the natural spinners on the surface, and easy to spot unnatural imitations and the leaders attached to them. Therefore, fine tippets – 5X at least, and often 6X or 7X is needed – and perfect drag-free presentations are critical for consistent success during spinner falls. I also find that downstream slack-line presentations generally fool more fish than upstream or up and across presentations when fishing spinners to picky trout. On the plus side, the patterns used to imitate spinners are simple and easy to tie. A few split tail fibers, a slender body of dubbing or quill to match the color of the natural, and a pair of spent wings of synthetic or natural material is all it takes. Of course the correct size is important. Spinners, like most insects, always look larger than they really are when seen flying in the air, so try to catch a few naturals to get a good match in size and color. The color and size of males and females differ significantly for some species. When that happens, match the female rather than the male, since it is predominantly females that end up floating on the water’s surface. Despite all the different species of mayflies out there, the most common spinner color by far is a rusty brown. If you keep a selection of rusty spinners from size 12 to 20 in your fly box, you will be well prepared for most spinner falls you might encounter. For a comprehensive selection of proven spinner flies, see our Mayfly Spinners. 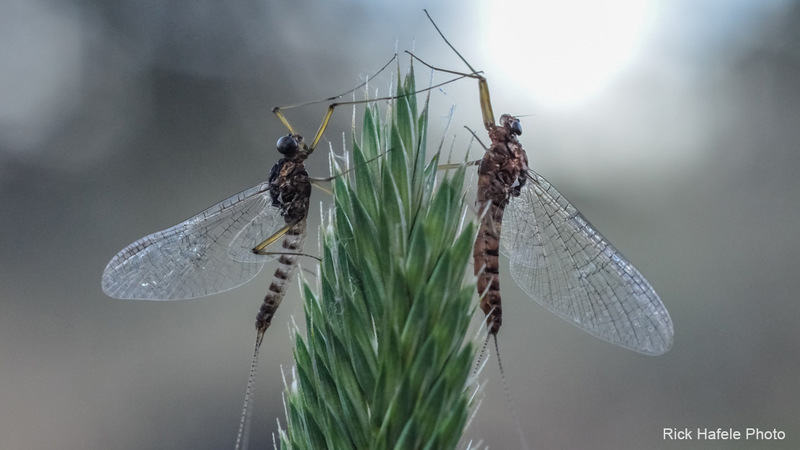 For in-depth information on the behavior, effective patterns, and fishing tactics for each life stage – including spinners – of all western mayflies, check out Rick’s latest book (co-authored with Dave Hughes): Western Mayfly Hatches.